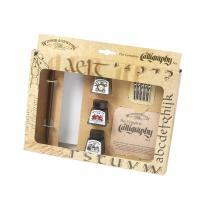 Calligraphy pens are specifically designed to use for lettering. 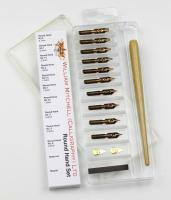 When choosing a pen you need to take into account the type of nib you are looking for. 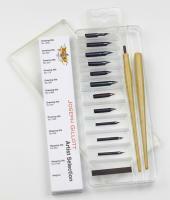 With calligraphy pens, there are two main kinds of nibs: italic nibs and flex nibs. Italic nibs have a blunt edge, often available in different widths, usually used for squared styled lettering. These nibs don't have as much flexibility in terms of line variation. 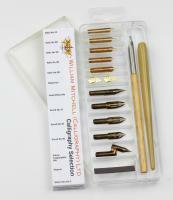 Flex nibs are rounded with two tines that come to a point and split apart when pressure is applied. The more pressure you apply when writing, the more they separate and the wider the line width. 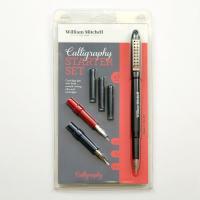 Usually you apply more pressure during the down strokes as the nib tends to catch on paper if you do a heavy up stroke. This is the technique used in most modern and pointed pen calligraphy. 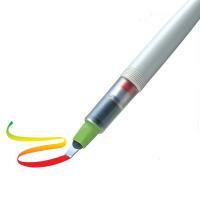 Cartridge filled pens - the ink is held in the belly of the pen in either a disposable or refillable cartridge. 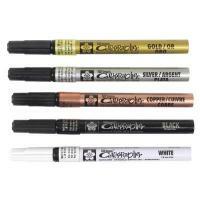 Disposable pens - usually have an italic nib. You can't change the nib or refil the pens.